HANOI, VIETNAM—Ba Sao Investment recently installed a complete audio system by HARMAN Professional Solutions at the Vietnam National Puppetry Theatre. 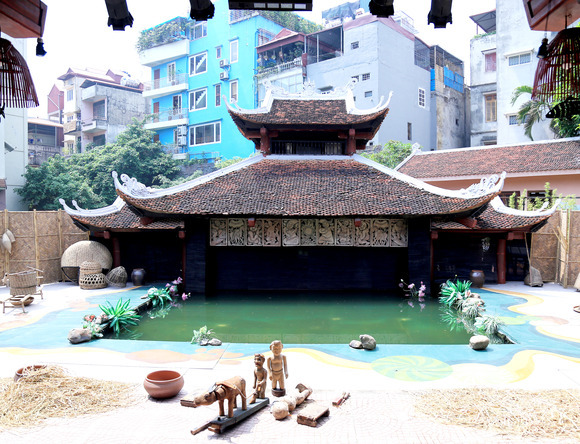 Since 1956, the Vietnam National Puppetry Theatre has preserved the uniquely Vietnamese art of water puppetry, hosting multiple performances per week. Considered a cultural highlight in northern Vietnam, these shows combine dramatic performances by skilled puppeteers with accompaniments by a traditional Vietnamese orchestra. In order to enhance the performances and ensure superb audio quality for audiences, the National Puppetry Theatre hired Ba Sao Investment to upgrade its aging audio system with a complete end-to-end HARMAN audio solution. The HARMAN sound system Ba Sao Investment installed in the National Puppetry Theatre includes JBL VT4886 line array speakers and VT4883 subwoofers, JBL PRX412M 12-inch portable speakers, JBL AWC129 weather-resistant speakers, JBL AC 25 ultra-compact speakers, Crown DSi2000 power amplifiers, dbx iEQ-31 equalizer/limiters, a Lexicon PCM92 digital effects processor and a Soundcraft GB8 series mixing console. Ba Sao Investment designed the audio solution around JBL VerTec series line array speakers and subwoofers, which offer excellent performance and coverage in a compact footprint. PRX412M portable speakers provide clear and precise stage monitoring, while JBL AC25 ultra-compact speakers offer high output and 90° x 90° coverage. JBL AWC129 full-range speakers are highly weather-resistant and satisfy the theater’s outdoor use requirements. The entire system is driven by Crown DSi 2000 amplifiers, which deliver unmatched sound quality and reliability. To ensure maximum sonic performance from the system, dbx iEQ31 graphic EQ/limiters offer 31-band equalization, AFS™ feedback suppression, Type V™ noise reduction and PeakStopPlus® limiting. The Lexicon PCM92 is the most advanced reverb and effects processor in its class and lends its famously rich and smooth sound to the productions. Finally, a Soundcraft GB8 dual-mode topology audio mixer brings industry-standard mixing control to each performance.